Whether you’re a first-time event organizer or a seasoned professional, discover how to successfully plan, implement, promote and manage festivals and community events of all sizes, shapes and kinds. Unique insights, tips, tools and resources are based on years of hands-on experience. 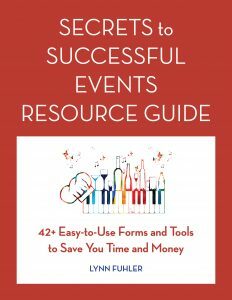 This easy-to-read handbook follows a logical progression taking event organizers from inception to thank you letters and everything in between. Discover how to find volunteers to serve on your organizing team and during the event. Find out what sponsors need and want in order to sign on the dotted line and what the event can do to guarantee sponsors return year after year. Gain an understanding of how budgets, event finances, money handling and online ticket sales work. Master the key elements required in marketing a festival and the role public relations plays before, during and after the event and in the world of social media. Explore specific festival and event themes: music, food, wine, beer, books and film, plus air shows. Learn the steps involved to book talent – headliners, artists, speakers, musicians, pilots, performers, wine makers, authors, chefs, entertainers and brewmasters. Review revenue generating options – the sale of merchandise (design, production and inventory control) and vendors/concessions (applications, selection, menus and set up). See how all the pieces fit together when reading cover-to-cover. For those interested in select topics, cross-references are included for more details. “Drag out the sticky notes, highlighters and note pads and prepare to be immersed in a comprehensive crash course on event planning as the author “holds your hand” and takes you step by step through the dynamics necessary to plan successful events of any size or type. Written in an easy-to-read format with a cutting edge approach, every one of its 283 pages contains tips and suggestions that will lead you on the path to success. Whether you are a newbie or seasoned veteran, you’re sure to use this book as a resource guide time after time for yourself and your organizing committees. “A tour de force to be sure, Ms. Fuhler has pulled all the stops. Written in the author’s characteristic horse sense style, this tome neatly balances depth with breadth, humor with pragmatism. While someone new to event planning might consider this a must-have playbook, it is also loaded with value for a seasoned veteran as well – a roadmap to continuous event improvement. “Secrets” has something for everyone, regardless of event size. A variety of event types are covered. Ms. Fuhler’s years of experience in travel, PR, and entertainment shine through. Particularly impressive, however, is her understanding – and nuanced exploitation – of digital media. How many event organizers even consider the role that a blogger’s “casual energy” could play? “As a school teacher who has lived in many communities, large & small, I have always enjoyed being an active part of that community and throwing myself into its varied life, especially when there’s a call goes out for its people to pull together in some common cause dear to the hearts of those who care about their community & wish to see it survive & thrive. As such, I often find myself involved in community events at some organisational level and have seen how it takes more than hard work & willing hands to make all the difference to a successful outcome; it takes careful forward planning, knowledge honed by experience, & genuine leadership & people skills to make it all work. A bit like life really. If you’re an experienced event planner or festival organizer looking for a quick-start guide to hosting and promoting your next event, this Resource Guide is the answer. It features sample letters, contracts and forms used in key areas: sponsors, marketing, publicity, talent, volunteers, merchandise, vendors/concessions and more. 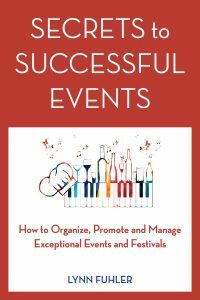 If you have minimal experience in event planning and want to jump start your event, we suggest you pick up Secrets to Successful Events: How to Organize, Promote and Manage Exceptional Events and Festivals, as well as this book. Together they explain not only what needs to be done but how to manage all the details and create a crowd-pleasing event. Quickly organize your committee’s structure and establish operating procedures. Communicate effectively with sponsors – using sample proposals, contracts, invoices, checklists. Master the budget process and track revenue and expenses. Discover marketing tools, PR opportunities and social media tips. Protect your event using customizable contracts for sponsors, talent, vendors/concessions. Use our handy forms when booking talent from headliners, artists, speakers and musicians to chefs, entertainers, winemakers and brewmasters. Easily track talent travel arrangements and equipment needs. Learn how to solicit and sign up volunteers. Take control with RFPs and bid specifications for graphic design, merchandise, sound and lighting. Wrap up the event using pre-created thank-you letters. Based on the author’s years of experience in event planning, you’ll discover the essential tools, forms and resources every event organizer needs to get your event off the ground and running quickly. Throughout her career, Lynn Fuhler has successfully organized and promoted numerous festivals as well as corporate and community events and leadership programs and activities. The former Tourism and Convention Director of Clearwater and Clearwater Beach, FL – named TripAdvisor’s #1 Beach in the U.S. in 2018 – she has worked extensively with the hospitality industry to market destinations, festivals, events and visitor activities throughout the world. She is the former Event Chairman of the all-volunteer Clearwater Jazz Holiday, then the largest free jazz festival in the Southeast U.S.
Lynn Fuhler is a consultant, speaker and publisher of a blog which focuses on all aspects of festival and event planning. A native of Illinois and the greater St. Louis area, Lynn holds a B.S. degree in transportation, travel and tourism from St. Louis University’s Parks College. Now based in North Carolina, Lynn is the co-founder of Flying Compass, Inc., a hospitality marketing company, and Savvy Rooster, a wine-centric tourism and digital marketing agency.